On December 3, 1593, Luis Perez Dasmariñas became governor-general ad interim by virtue of the appointment of his father Gomez Perez Dasmariñas. He was knight of Order of Alcantara. Earlier, in an expedition to the Moluccas which set sail on October of 1593, the old governor-general Gomez Perez Dasmariñas was killed by Chinese crew who mutinied. In the papers from the dead body of the governor was found an express wish that his son be his successor. Luis Perez was accordingly appointed to the office and became Governor-General. "Don Luis Perez Dasmariñas, knight of the Order of Alcantara, governor and captain-general of these Filipinas Islands for the king our lord, and founder and owner of this village of Binondo. He obtained this land by purchase, March 28, 1594, from Don Antonio Velada, husband of Doña Sebastiana del Valle, for the sum of $200. This sale was authorized by the certificate of Gabriel Quintanilla, a notary-public, one of the number allotted to this very illustrious and loyal city; and the grant of feudal rights over the Sangleys and mestizos of this said village, on May 29, 1594." During his incumbency, Manila was improved, new buildings were erected, and the Manila Confraternity of La Misericordia, home of the orphans and distitutes, was founded. In 1595, under Luis Perez, Cagayan, Viscaya and Isabela was subjugated. 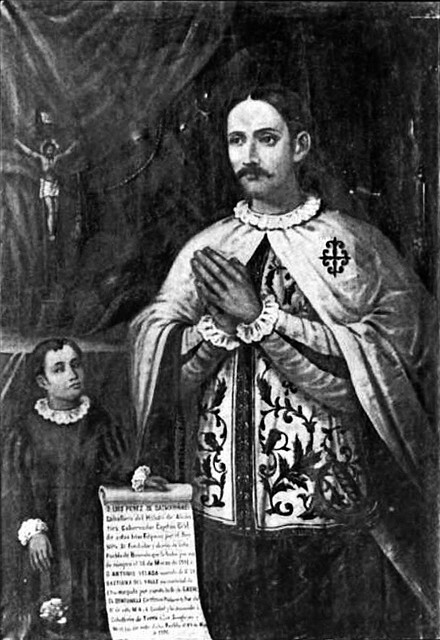 Doctor Antonio de Morga arrived during this year in June 11, who was appointed lieutenant governor by virtue of a royal cedula who took charge of spiritual affairs. Expeditions were made to Cambodia and to Mindanao under his term but with indecisive results. His term ended July 14, 1596, was succeded by Francisco Tello de Guzman. Luis Pérez remained in the country and settled in Binondo. He was killed by Chinese rebels in the Sangley rebellion of October 1603.